On Thursday, February 7, Our Lady of Częstochowa reached Madrid. The visit in the capital of Spain started with the collegiate church of San Isidro el Real (St. Isidore), the patron saint of the city, who was much devoted to the Virgin Mary. In the years 1885 -1993 this church was the co-cathedral of Madrid, until John Paul II consecrated the cathedral known as Almudena. The church was full of people (about 400 people). The Holy Rosary in defence of life and family was said. Next the Holy Eucharist was celebrated. 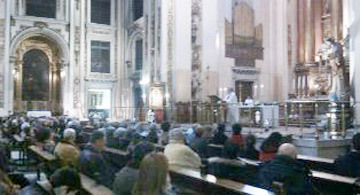 It was presided over by bishop Cesar Augusto Franco of the Madrid Archdiocese. After the holy Mass the faithful had an opportunity to pay homage to the relics of St. Isidore el Real and his wife St. Mary de la Cabeza. On Friday morning at 10 AM the Icon left the collegiate church of St. Isidore and went to the church of Our Lady of the Angels, which celebrates the 100th anniversary of its consecration this year. This is the church connected with the founding of Opus Dei. When on the 2nd of October, after celebrating the Holy Mass, fr. Josemaria Excriva de Balaguer had a vision of Opus Dei at God`s inspiration, the bells of the church of Our Lady of the Angels were ringing. Then he went to his room and started putting his notes in order: decisions, resolutions, inspirations – collected during his prayers and considered for a long time ... It was at that moment that something he had waited for for a long time occurred: he saw what God wanted him to do. Later, when he was talking about this supernatural event he always would say “see”: it was a vision of Opus Dei, just like God wanted it to be, now and in the future centuries. At 8 PM the Holy Rosary in defence of life and family was said. There were around 400 people praying at the church of Our Lady of the Angels. Next the Holy Mass was celebrated. After the Mass there was a prayer vigil prepared by the Pastoral Department for Children and Young People of the Madrid Archdiocese.